community of educators in chemical engineering. 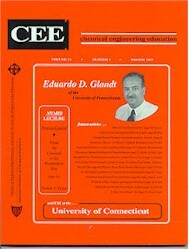 archival journal for chemical engineering educators. The journal originated in 1962. CEE is a recommended journal indexed by ERIC, CAS Abstracts, Compendex, and Scopus. Send mail to cee@che.ufl.edu with questions or comments about this web site.